At CIE Tours International the focus of all of us is to deliver the best possible vacation to every client on every tour. For many people a trip to Ireland and Britain is a dream fulfilled and we want everyone to have a remarkable travel experience. After all, it may be a once in a lifetime trip for some while others are so entranced that they return time and time again. We monitor all aspects of our travel programs carefully by choosing local tour directors and training them in every detail; by inspecting all hotels and attractions; and by listening to our clients. 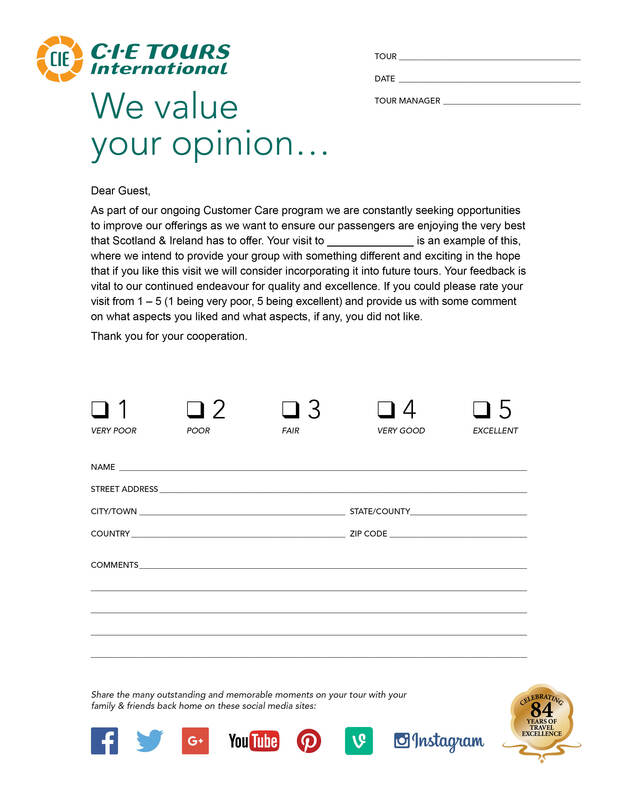 At the end of every coach tour, we distribute a questionnaire so that travelers can evaluate their own experiences and give us feedback. All completed questionnaires are fed in to a computer program that provides us with percentages on every facet of the tour. Our Quality Control Department follows these ratings and comments very carefully and, if not up to our standards, the hotel, restaurant or visit is advised that it needs to improve if it wishes to continue to feature in our portfolio of tours. 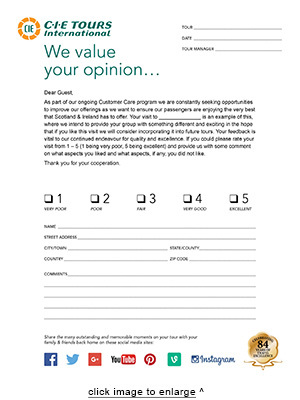 Here is a sample of a questionnaire we provide at the end of each tour. 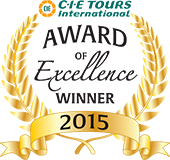 All companies that scored 90% or greater during the entire 2015 travel season receive an Award of Excellence. Award ceremonies for Irish companies are held in Dublin in February and for British companies in Scotland in April. 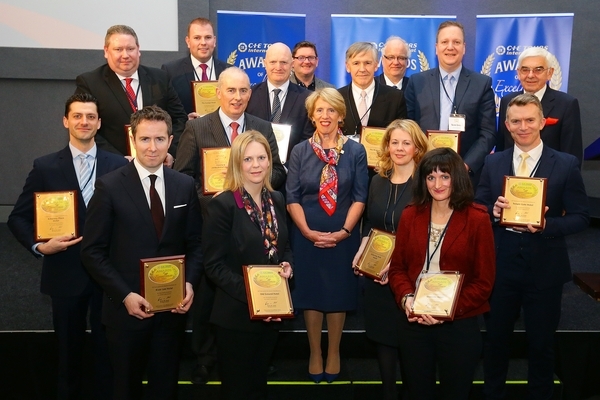 On February 2, 2016, the 26th annual ceremony was held at Dublin Castle when winners from 98 companies all across Ireland were presented with plaques and given well deserved recognition – see the list below. 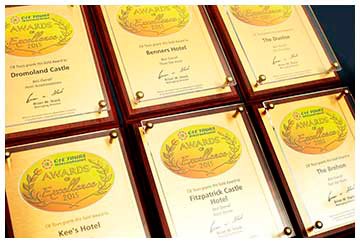 As Ireland is our major market the awards were more numerous and based on feedback from 28,000 of our clients. Companies are usually so thrilled with the recognition that they display the award in a prominent place. In hotels, it is usually at the check in desk so that clients can be assured that the standards of the property are high. During 2015, CIE Tours International’s clients were most impressed by the Slieve League Cliffs in Co. Donegal. Other attractions that highly impressed were the Cliffs of Moher, which had the most visitors, Blarney Castle, Blarney Woollen Mills, and the Skellig Experience, now featured in the new "Star Wars" movie, the Titanic Belfast, Waterford Crystal Factory, Trinity College's Book of Kells and the Giant's Causeway. Awards for British products started in 2011 as our tours to all parts of Britain, and especially Scotland, have become more and more popular. While the CIE Tours’ brand is not as renowned as in Ireland, the company is certainly growing its reputation as a quality and ethical company, not just for the clients who travel with us but also the companies that supply hotels, meals and visits of many different types. These awards will be held on April 19, 2016 at Edinburgh Castle and will go to 59 companies. As winners have not yet been announced for the 2015 season, see below for the 2014 winners. 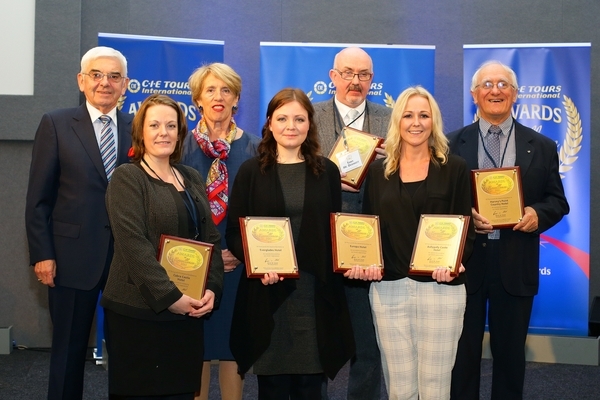 Munster Hotel 2015 Award of Excellence winners photographed with Ms. Vivienne Jupp, Chairman of CIE Group and Peter Malone, CIE Group. Ulster Hotel 2015 Award of Excellence winners photographed with Ms. Vivienne Jupp, Chairman of CIE Group and Peter Malone, CIE Group. 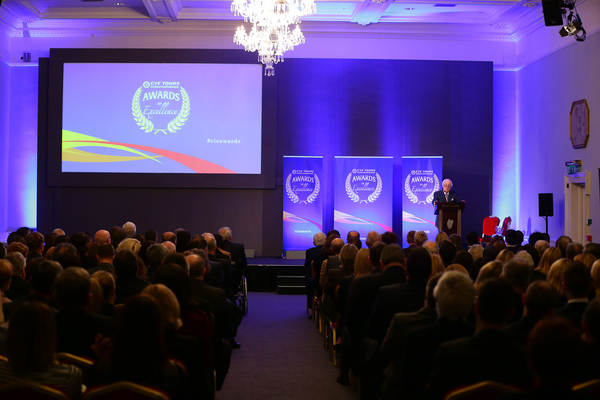 Mr. Brian Stack, Managing Director of CIE Tours International addresses the crowd at the 2015 Awards of Excellence, Dublin Castle.